Guster "Do You Love Me?" Pour the kahlua and bailey's irish cream into a glass. Fill most of the glass with milk, leaving enough room for the goldschlager. Float the goldschlager using the back of a spoon. My goodness! This isn't so much a cocktail as it is a sugar rush. Enjoy! With the holiday season quickly approaching I have some wonderful giveaways lined up on my review site Ann Again... and again Reviews. 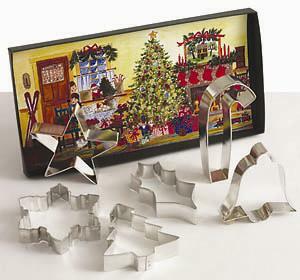 Currently there is a great offering from Cookie Cutters From Vermont - Ann Clark Ltd; a 5-Piece Christmas Gift Set. If you would like the chance to win this perfect for the holidays gift set click over to Ann Again... and again Reviews. They are also offering a discount for my readers with a special code. Good luck!